Abstract—The objective of this work was to evaluate the effectiveness of integrated biological conventional treatment with membrane bioreactor (MBR) system in removing organic and nutrients from dairy industry wastewater. A pilot treatment system including biological treatment and submerged MBR system was installed at Kuwait Institute for Scientific Research (KISR) research plant. The integrated MBR system was operated at the following conditions: average influent flow rate of 1 m3/d, average sludge retention time (SRT) of 38 d, and average hydraulic retention time (HRT) of 2 h. The results clearly show the performance of the integrated system in removing organic matters with an average removal efficiency of 99% for both biological oxygen demand (BOD) and chemical oxygen demand (COD). However, good reduction in nutrients concentration in the system effluent. The average reported efficiencies on total nitrogen (TN), ammonium (NH4-N) and total phosphorus (TP) were 45, 44.8 and 67.1%, respectively. Index Terms—Dairy, industrial wastewater, membrane, removal efficiency. Saud Al-Shammari is with the Environmental Health Departments, College of Health Science, The Public Authority for Applied Education and Training P. O. Box 14281, Faiha 72853, Kuwait (e-mail: s.b.alwan@gmail.com, salalwan@gmail.com). 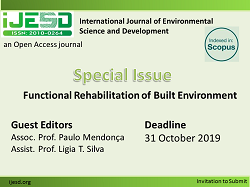 Cite: S. B. Al-Shammari, "Simultaneous Organic and Nutrient Removals from Industrial Dairy Wastewater Effluent by Integrating Membrane Bioreactor and Conventional Biological Treatment Process," International Journal of Environmental Science and Development vol. 9, no. 6, pp. 157-161, 2018.